Kevan Jon metallic tweed checkered three piece Harriet jacket trousers and bustier. A fabulous three piece combination made in Prince Of Wales check fabric with silver metallic threading and contrast green edging and trim. Comes with the Natalia bustier in the green contrast with balloon style detachable sleeves and exposed back zip. So many combinations for this outfit we feel dizzy! 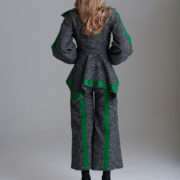 The jacket has a zip to give a snug fitted shape in a wrap over style with longer coat tails at the rear. The trousers are cropped wide leg with the contrast green edging detailed on the back and waist. This outfit looks fantastic worn together but will equally add some contemporary interest to pieces you already own. Blush Boutique are delighted to be one of the few stores to house the UK’s most up and coming designer – Kevan Jon. Kevan creates wearable exciting fashion for ladies looking style with edge. His unique designs are worn by a host of celebrities and is a firm favourite with our customers who frequently declare “ I love his stuff!” Kevan Jon designs will have you looking fabulous at your next wedding, party, black tie event, right through to poolside to glamour.